the reason for using "material" is that it disguises the canvas effects a little - blends into the image better. View both images at full size to see it better - the bridge detail here, and the posts and ducks in the other. A black and white Tiled image created with DAP, similar to a Photoshop Filter Effect. My image was 5600 x 5600 pixels so as to have an even tiled effect. I used a Black and White tonal palette of 86 tonal values and the rest black on a Black background. I used a 16 pixel square 255 value white brush in all of the 100 slots. In a Grayscale AOP Template I used the Advanced Settings Brush Placement X and Y Grid to create the tile effect. The settings were 250 for both X and Y so as to leave a border around each square brush. It seems the parameters are a minimum of 0 to a maximum of 255 positions or coordinates for each Grid setting. X is left to right and Y is top to bottom of the image. NOTE: if you change brush size and or image size all of these parameters will change accordingly so get your calculator out. In the Advanced settings of the AOP Template disable the settings Random Brush Rotation and Random Brush Size. The Minimum Brush Size and Maximum Brush Size were both set to 450 to get a square brush that would paint. Set Maximum Brush Strokes between 125,000 to 140,000 for a 32 Meg. Any longer and it will start to paint over the border due to color compilation. Also, disable the Graph for Relative Brush Size and Strokes. Set the Detail Brush to 0. The above also works with a 16 pixel dot as a brush. Color is a bit more complex and I will let you all play with that idea. I found out something interesting, it came about by seeing some template remixes have hard style changes between the mixed styles. Remix A and B - lets say A = Benson, B = Monet. The under painting I used to have benson then detail brushes as monet. But it gave hard changes between the two. So i played - I made benson the main underpaint and then added monet as the secondary. I added monet as the main detail part then added benson as secondary details. I then painted both, one dry, one wet, from each.. The end result is a softer graduation between the syles, they blend together better. AOPs are available, but you can make these ones yourself if you wish. Stopped in to update DAP & Photo Blend for the first time in 2 years ... Really regressed to be a DAP Newbie ... Thank You all for the contributions to 'DAP Tips and Tricks' ... it's not just a manual ... but a journal of communal generosity ... most sincere thanks for the cornucopia of AOPs you share ... I spent time with your paintings ...leaves me breathless to see how all of you have molded DAP into such individual artistic expression. What has awakened my interest in making a new beginning with DAP? Several years ago I gave a DAP painting of the Bugatti Royale to the owner of a commercial printing shop. He called me and told me he is retiring. I was so surprised he remembered my painting He gave me an unexpected gift, 300 pieces of thick richly textured paper custom cut to A4. I need a little advice. What AOP was the basis for the incredible portrait of the young woman featured on the Mediachance homepage of Dynamic Auto Painter? Another thing, I'm not satisfied with how my printer,an Epson Stylus Photo 1400 decides to print my newbie paintings. Mary what was that print program you mentioned you prefer for your art? I think the program was called Q ........... ? How nice to have you back! We have certainly missed you and as you can see, DAP has progressed tremendously since you've been visiting us. The ability to integrate it with Reactor and the new levels of control we have over the creation of AOP is wonderful. Hope you'll stay around for awhile and help us keep our Tips and Tricks updated. The program I use for printing is in fact Qimage. I am still using an older version which works quite well for me but I believe the latest version has a few more bells and whistles. I believe there is a trial version. Give it a whirl. So nice to have you back. Now if only we could fine Ana again. In the quest for trompe-l'œil or fooling the eye, here's yet another trick. 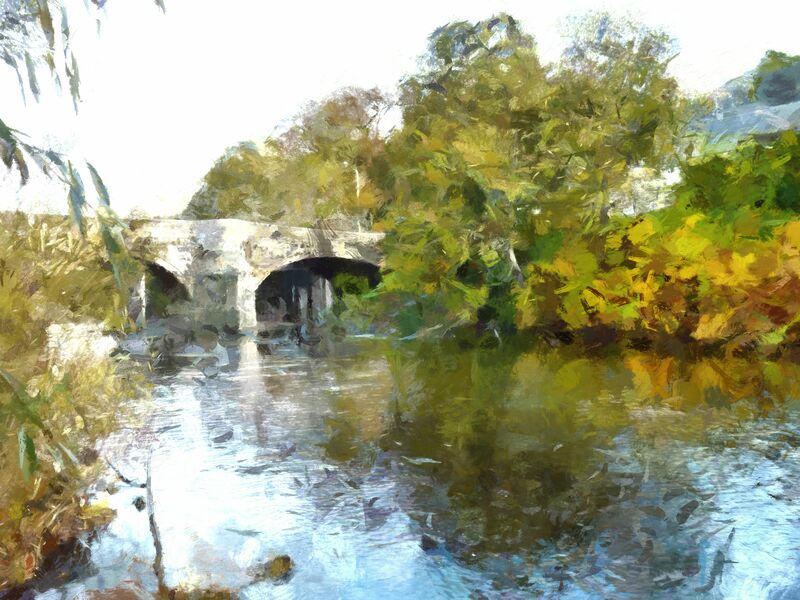 It uses another painting program called FotoSketcher which is a free download. It has some simple and convenient functions which we can use for texture. 1.Paint your image as usual in DAP. 4.Use the Merge source & result selection to adjust the effect. 4.You can also add a canvas texture at the same time or separately. The end result is that from far away the painting still looks like the original. But up close, the paint is broken up with a hatch texture that gives the illusion of brushstrokes. There's plenty of adjustment available to tailor the effect as desired. The newest FotoSketcher has a neat thing called Merge, you can merge the images after painting. Is there a way to paint only on the non transparent part of the transparent png? I believe DAP always paints on an opaque canvas, and with new dimensions anyway, but never directly on an original image. To make the result partially transparent again, you may have to extract a transparency mask from an original alpha channel, scaled to the dimensions of the new painting, and apply it to your result in an external image editor (like PhotoShop, GIMP, or similar). Please tell me witch AOP i use to do this i dont need painting i want only regenerate it on higher resolution without noise and loosing quality. You will always lose quality, technically ... but just resampling without any obvious brush strokes, try the "Realism" template, it only uses slight image filters.